Posted May 21st, 2018 by Harwood Engineering & filed under News. Posted September 18th, 2017 by Harwood Engineering & filed under Technical Papers. This technical paper describing the methods, concepts, and operation of a 150,000 PSI dynamic pressure calibrator was originally written in October of 1987. All tests were performed by the US Army Ballistic Research Lab at the Aberdeen Proving Ground in Maryland. Posted March 1st, 2016 by harwood & filed under News. Harwood Engineering has supplied pressurizing equipment for autofrettage service since its inception in 1948. Generally, the requirement has been for the autofrettage of large steel forgings. Recently, however, we have developed a system for the pressure testing and autofrettage of small parts, such as diesel nozzles and manifolds for diesel engines. Excessive torque, side thrust, and friction make crank-driven pumps cumbersome and expensive at high pressures. But in hydraulically driven pumps, these effects are eliminated or minimized and higher pressures can be attained. Also, longer strokes are characteristic; therefore, rates of stress buildup are reduced in such areas as check valves and packings, which result in less maintenance and longer life. Without rotational inertia, controllability is increased which in turn increase safety. 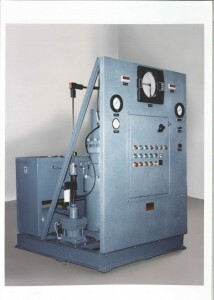 A number of improvements in apparatus and technique have been made since the production of the prototype model of the controlled-clearance piston gage used by Johnson and Newhall in their 1953 determination of the freezing pressure of mercury at 0oC.